Unfortunately we are closed from 4pm on Sunday 7th April to 5pm on Monday 8th April whilst essential work is carried out. Dating from 1681, The Bertie Arms is a cosy and charming free house which promises a relaxed and friendly atmosphere to all. We welcome well behaved families with open arms and dogs are welcomed in the bar areas of the pub. Situated at the heart of the village, The Bertie makes every customer feel like a local. "Seriously good food in an unserious way.” From simple pub classics with a twist to gastronomic delights, Dan, Sam and the kitchen squad relish the opportunity to work with the freshest and most exciting produce they can lay their hands on. Take inspiration from our sample menus but please note that our offerings change daily depending on what is in season and locally at its best. We serve homemade cakes and fresh coffee daily from 9am. Lunch is 12 - 2.30pm, dinner is 6:30 - 9pm and roasts are served from 12 - 4pm every Sunday. When the sun is shining and the garden is in full swing, we also serve street-food from the Shepherd’s Hut. Alongside an ‘un-stuffy’ yet interesting wine list the bar features 4 superbly kept real ales. Oakham Ales are ever present (we have heard accolades of the best Inferno in the area! ), plus a constantly changing variety of other real ales. We also offer a great choice of premium draught products, gins and speciality spirits. There's always something going on at the Bertie, from quizzes and book club to major sporting events and special tasting menu evenings. 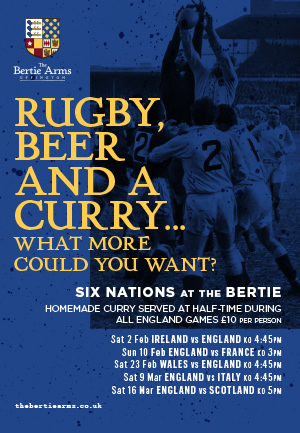 The Bertie Arms in Uffington is a family-friendly pub run by Katie and James Genever. The pub is situated on Bertie Lane and has ample free parking. The Trollope bar welcomes you, the Bertie Bar and Long Room have tables for dining and our room upstairs can be booked for private events. Here at The Bertie Arms we are all about our community. We strive to keep strong relationships with our customers, local residents and other organisations in our surrounding area. We love to support local initiatives and host various charity events. 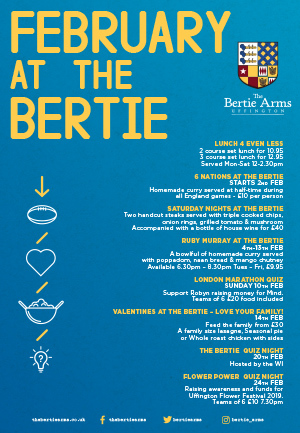 The Bertie aims to be something for everyone, whether that be a coffee venue for our Knit and Natter group, a meeting space for The Village Midwives ante-natal group or indeed a place for our local cricket club to celebrate victory.